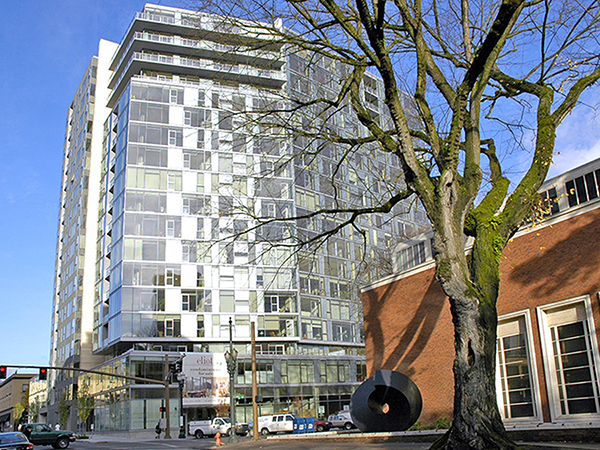 The Eliot Tower is located in the Cultural District at SW 10th and Jefferson. It is just across the street from the Portland Art Museum. The Eliot features 220 residential condominiums of various styles including traditional floor plans, lofts, town homes, and penthouse suites. Amenities include concierge service, high ceilings, granite counters, gas fireplaces, fitness center, secured parking and a outdoor terrace. Walk to museums, theaters, park blocks and downtown restaurants. There are 7 listings found for Eliot Tower. Great west facing condo at Eliot Tower. One of the most beautiful lobbies in Portland! West facing deck with panoramic views. Hardwood floors. Beautiful stone counters. Huge utility room. This building has lots of amenities! Library, meeting room, exercise room, community kitchen that opens to a large terrace area with covered area and BBQ's. Concierge service. On the Streetcar line. Across the street from Portland Art Museum. Light, move-in ready condo, gourmet kitchen w/ new frig & island w/ wine cooler, light maple hardwoods, large west-facing balcony w/ gas bbq grill, huge laundry room w/ built-in storage, washer/dryer & parking space included. Right behind Portland Art Museum, events at the Schnitz, Farmers Market, downtown shopping, iconic architecture & Streetcar. Building amenities incl. gym, library, mtg room, 3rd floor common deck & 24/7 concierge. Check out this prime location in Portland's Cultural District, close to Portland Art Museum, Arlene Schnitzer Concert Hall,Farmer's Market,and shopping. The condo boasts a wall of windows with a view of the City. Enjoy outside views from your private deck.Inside amenities include wine frig,granite counters/island/eating bar. Parking & Storage too!Location,location,location!